Germany had mainly two names for vampires: Nachtzehrer (“night waster”) used in Northern Germany and Blutsauger (“bloodsucker”) used in Southern Germany and Bavaria. The Nachtzehrer was similar to the Slavic vampire in that it was known to be a recently deceased person who returned from the grave to attack family and village acquaintances. It usually originated from an unusual death such as a person who died by suicide or accident. They were also associated with epidemic sickness, such as whenever a group of people died from the same disease, the person who died first was labeled to be the cause of the group’s death. Another belief was that if a person’s name was not removed from his burial clothing, that person would be a candidate for becoming a Nachtzehrer. 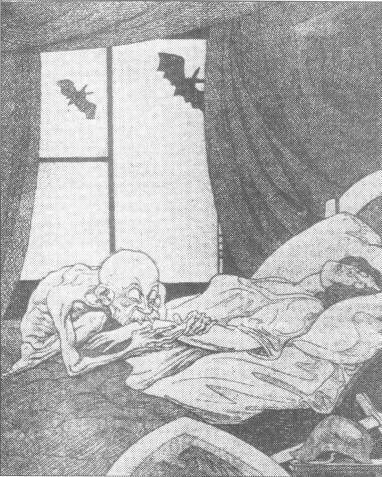 Nachtzehrers were believed to chew on their own extremities and cloths until they had been satiated. They would then rise out of their graves and devour the bodies of others like ghouls. They were often accompanied by the corpse of a woman who had died during childbirth. If the vampire had been buried in a coffin, the corpse would be found lying in pools of blood because he had gorged himself to the point where he could not retain all the blood he had consumed. To protect themselves from the Nachtzehrer, villagers would place clumps of earth under the vampire’s chin, place a coin or stone in its mouth, or tie a handkerchief tightly around its neck. In other cases, the corpse would be beheaded, a spike would be driven through head to pin the corpse to the ground, or the tongue would be fixed into place. In Bavaria, people who were not baptized Roman Catholic, were involved in witchcraft, lived an immoral life, or committed suicide became Blutsaugers. Those that ate the meat of an animal killed by a wolf, or had an animal or nun jump/step over their grave also were likely candidates. They were pale in color and resembled zombies. Bavarians protected themselves by smearing garlic over their doors and windows and placing hawthorn around their houses. Those residents with a black dog could paint an extra set of eyes on the animal, which was also thought to ward off vampires. Blutsauger could be killed by driving a stake though their heart and stuffing garlic in their mouths. Just a quick thanks to everyone who emailed me the correct spelling of “Blutsauger”. A number of you also pointed out that Germans also say “Vampir” as well. Second thing is your translation of “Nachtzehrer”. For me as a german (and one-by-one translated) “nightwaster” sounds wrong since they use the night to feed themself and don’t waste this very share of time they got to. “zehren” means “to live on” or “to feed on” in special ways “to gnaw at”. Maybe “nightgnawer” would fit better. “Bluatsauger” is spelled right this way if you want to use the orthography of Bavarian Slang where it comes from; the “German match” would be “Blutsauger”. However, both means bloodsucker, as you say and both words work as singular and plural.